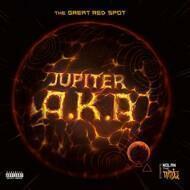 The Great Red Spot is the first official project of the crew Producers' Jupiter A.K.A , the collective is composed of Astronote,Kyo Itachi and Azaia. They worked with some artists last 10years in the underground and mainstream , Astronote produced one track on the project "Untitled Unmasterised" by Kendrick Lamar last year, Kyo Itachi joint force on "Meteorite" with Ruste Juxx and Azaia put a solo album in 2014. For This project they invite a young talented Mc from Detroit Nolan The Ninja,Rockness Monstah from Heltah Skeltah and many strong mcs like Ruste Juxx,Skanks The Rap Martyr,Mic Handz,Vvs Verbal,Milez Grimez & Da Buze Bruvaz.